This recipe is similar to my previous post (the Vegan Lemon Tart, click here for recipe), it’s the same dough, except I swapped out a few ingredients to make it more suitable for a savory recipe and of course the filling is different. I really like how easy it is to make the dough because it is no-roll, so I thought “hey”, let me make a savory version of this tart. For the filling I used vegetables that I had at home, but you can pretty much use whatever vegetables you like that roast well, like sweet potatoes, bell peppers, just don’t use cucumbers:) This recipe can be enjoyed by non-vegans too, I am not vegan, but I enjoy experimenting with all kinds of recipes. You can add cheese to this if you like! *In place of the tomato paste you can use any kind of vegan spread like olive paste or vegan pesto. If you are not vegan you can use cream cheese. Combine the flour, starch, salt, baking powder, white sugar, black pepper and turmeric; whisk together and set aside. In a small mixing bowl combine olive oil and milk, briefly mix then add your wet ingredients to the dry mixture and mix with a silicon spatula until a ball of dough forms (it might form into a few large clumps instead of a whole ball). Preheat oven to 450ºF (230ºC) without fan/ventilation. In a large roasting tray/pan add all of your filling ingredients except for the tomato paste, toss well together with your hands, to make sure that everything is well coated in the seasoning and olive oil. Flatten out, bake for 15 minutes. After 15 minutes of baking, remove from the oven, give it a mix, then bake for another 20 minutes, then remove from the oven and set aside. Reduce the oven temperature to 350ºF (180ºC). 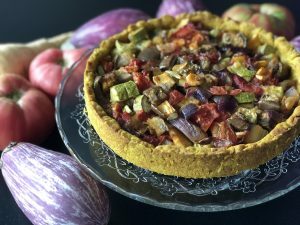 Once your crust has chilled, remove it from the fridge, spread the tomato paste on the bottom then add in your roasted vegetables filling up the crust all the way, (if there is a lot of liquid from your roasted vegetables, try to remove as much of it as you can before adding the veggies to the crust, to avoid a soggy crust). You might have more vegetables than you need, store them in an airtight container in the fridge for up to 4 days. Place your pan on a baking tray and bake your tart for 50-55 minutes, or until the edges are golden brown. Remove from the oven, allow to cool completely to room temperature (about 2 hours) before removing from pan. You can serve this at room temperature or cold from the fridge, it goes great with freshly chopped herbs on top. Store in the fridge covered for up to 3 days.